I was reminded recently that every time I have a speaking engagement there may be a wall between me and the audience. It’s my job, as the speaker, to engage the audience and break down that wall. If I am successful, that wall becomes a bridge between them and my subject matter. Maybe it’s me who becomes the actual bridge…so they can know, understand, and engage the subject matter as I have. The problem is that my subject matter is usually something that my audience finds hard and confusing. In many ways, we automatically have a wall when it comes to the Israel/Palestine conflict. A mile-high, cement, no…steel, wall in many cases. Either because we think we know, or we really don’t want to know or have a responsibility in it. In many ways, it reflects our lack of understanding, our biases, or even our ignorance. So, we reinforce those walls to insulate and protect. But, those protections actually limit us, just like a physical wall limits movement. And in many cases, those walls can hurt others. I have been hammering away in talks recently that when engaging the Israel/Palestine conflict, we actually confine the conflict to Israel/Palestine. We do not converse on Palestinian refugees -- the diaspora. Millions living without citizenship in permanent refugee camps and lacking the basic human rights you and I take for granted. Why do we omit them? Part of it is our lack of knowledge of Palestinian refugees and the situation of their everyday lives. There are so many walls to actually engaging and knowing Palestinian refugees in Lebanon, Jordan, and Syria -- including but not limited to cultural, physical, and language walls. How many news reports, stories, books, films, or TV series feature Palestinian refugees living outside of Palestine? Their lives are hidden from most in the West. I often wonder if one of the walls is our own guilt and confusion. How did the world let a people group be displaced to form the state of Israel? How does the world allow them to live in squalor as permanent refugees for the past 70 years? Are we not all complicit in keeping generations of our fellow human beings in permanent refugee status? I have seen people get angry at the injustice when they learn about it. I have also seen anger that the topic of injustice to Palestinians would ever be brought to light. As a result, I have seen people play the blame game. It’s the Arab countries’ fault, it’s Israel’s fault, it’s the US’s fault, it’s the PLO’s fault. While all of those excuses are valid to one degree or another, it also allows us to stay angry — to not take responsibility in our own response. It’s another wall to protect ourselves and to remain in status quo. “Nothing to see here folks; just move along and leave me at peace.” Or we use our anger to fuel us, but that becomes another wall to those on the other side. What is our response to injustice? I grew up Catholic. I don’t remember much, but I do remember my mom making me go to confession every Saturday before Mass on Sunday as a child. I hated it. I would receive a ton of penance from the priest, and also hated listing off my sins. Looking back, maybe because confession revealed the state of my heart. Now, whatever you think of a priest absolving you of your sins and the theology of that is not my point. Did you know that confession is known as the Sacrament of Reconciliation? Basically because we are confessing our wrongdoing against God and our neighbors to another person, and have a path forward (forgiveness and absolution.) I wonder if our reconciliation work surrounding Palestinian refugees starts with confession to one another of our ignorance, indifference, and/or bias of their situation? What if absolution is working to take down those walls between us and build a bridge together? Next post, I’ll address ACTION — A PATH FORWARD. Yeah baby, what bridge-building could look like! Here’s the episode of This American Life on “Walls” that took my breath away. 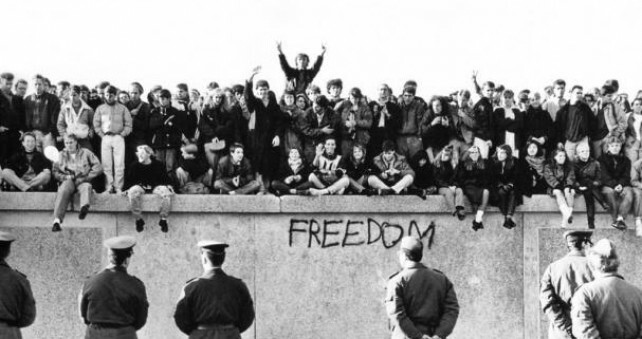 Fall of the Berlin Wall. November, 1989.